After instances where first-generation iPod nanos' power has triggered minor but device-killing fires, Apple has agreed to replace for free any more of the music players that suffer the same problem. The Cupertino, Calif.-based electronics maker has released a statement to the press confirming the issue and solution while also attempting to minimize the scope of the problem. "Apple has determined that in very rare cases, batteries in first-generation iPod nanos sold between Sept. 2005 and Dec. 2006 can overheat, causing failure and deformation of the iPod nano," the company explains. "Apple has received very few reports of such incidents (less than 0.001 percent of first-generation iPod nano units), which have been traced back to a single battery supplier. There have been no reports of serious injuries or property damage, and no reports of incidents for any other iPod nano model. "Any first-generation iPod nano customers who have experienced their battery overheating should contact AppleCare for a replacement. Any other customers who have concerns about their first-generation iPod nano battery should also contact AppleCare." The release comes at the end of a Japanese government investigation into reports of some original iPod nanos melting and even popping open due to excess heat, particularly when the device is plugged into a computer for recharging. Customers from other nations also say they have witnessed their iPods' self-destruction. 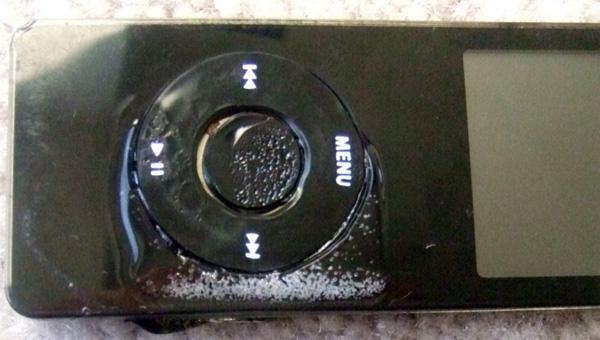 An American's iPod nano after a fire. | Image credits: The Consumerist. While unlikely to be directly connected, the problem is reminiscent of a similar issue with Sony notebook batteries that prompted a worldwide battery recall after it was determined that a manufacturing flaw made them overly susceptible to fires; since then, Sony has toughened up its designs to prevent such incidents in the future. It's not known if the issue extends to additional iPod nanos or other portable media players.